Home » HTML5 » How To Create A Cross Browser Compatible HTML Progress Bar? The semantic HTML5 < progress > element is used as an indicator to display the state of completion or progress of a task, i.e. the amount of work which is yet to be done. HTML5 < progress > element acts as a visual feedback demonstration for a user to keep tabs on the state of progress of the given task being undertaken. Usually, it is displayed in the form of a progress bar marked with numbers or percentage values. Note: If you wish to display a gauge(disk space or storage), HTML5 progress element would not be the right choice. You should use HTML < meter > tag instead. The < progress tag > has 2 key attributes – value and max. These 2 attributes define how much part(value) of the total task(max) has been completed at present. Value: value attribute indicates the amount of task that is completed, which is the current value. It can be any number between 0 to max attribute. In case max attribute is absent, the value can range from 0 to 1. In case, the value attribute is absent, then the HTML progress bar will be indeterminate. It will no longer indicate the current state of completion. Max: max attribute represents the total amount of work necessary for completion of a task. Value of max cannot be less than 0 and by default is set to 1. As we discussed above, a progress element can have 2 states – Indeterminate or Determinate. It all depends on whether the value attribute is mentioned inside the < progress > tag is mentioned or not. In case the value attribute is not specified then the result would be an indeterminate HTML progress bar which does not display the current state of progress. The opposite is true in the case of a determinate HTML progress bar. As you can see above, the HTML5 Progress element is cross browser compatible across all major desktop and mobile browsers covering 97.45% of the Internet user base as of March 2019. The only major exception is IE9 and below versions. Later in the article, we will explore different ways to code necessary fallbacks to elevate our HTML progress bar cross browser compatibility by using a polyfill to add support for IE8-9. If you wish to learn more about how modern browser work and Why Browsers Render Content Inconsistently, you can have a look at my previous article on Feature Detection For Cross Browser Compatibility. Before moving on to browser specific rules, let us look at the basic HTML5 progress element selector first. We can use the progress selector(or progress[value] selector) to change the background colour, height and the border radius of the progress bar. However, the background colour and border radius will not work with Google Chrome and other WebKit/Blink browsers as shown below. In fact, they will remove the default native styling and replace it with a green progress bar and dark grey background. In Firefox, the background colour and border radius rules are applied to the outer progress bar but not to the value. Microsoft Edge obeys all rules as intended. Now, in order to create a cross browser compatible HTML progress bar with uniform appearance across all browsers, we need to target pseudo-classes for both Webkit browsers(Chrome, Opera and Safari) and Firefox. Webkit browsers use 2 pseudo-classes to target HTML5 progress element : -webkit-progress-bar and -webkit-progress-value. -webkit-progress-bar : Used to style outer progress bar (container). You can change the background colour and the border-radius and box-shadow properties of the progress bar using this pseudo-class. -webkit-progress-value : used to style inner value bar. You can use this pseudo-class to change the colour of the value part of the progress bar. Mozilla Firefox uses a single pseudo class: -moz-progress-bar to style the value element of the HTML progress bar. Microsoft Edge and IE use : -ms-fill pseudo class to add styling like gradient background to value part of the progress bar. Now using these WebKit and Mozilla firefox pseudo classes, we can finally create our basic progress bar with light grey background(#777), light blue value progress part ( rgb(20, 240, 221) ), and rounded corners( border-radius: 20px ). We can take our styling a step further to create an HTML progress bar with stripes and gradient background. Simply add -webkit-linear-gradient and -moz-linear-gradient styling rules to ::-webkit-progress-value and ::-moz-progress-bar pseudo classes. HTML5 Progress element is supported by all major browsers except IE9 and below. To add functionality to these browsers, one way is to code a fallback using div tags. However, this leads to additional code duplication and effort on the part of developers. An intuitive alternative is to use one of the most popular and widely used progress polyfills created by Lea Verou. In order to ensure cross browser compatibility of HTML5 progress element for IE9 and 8, Simply add progress-polyfill.js and progress-polyfill.css files to your project. Here is a sample code below run on IE8 using LambdaTest Real Time Testing. 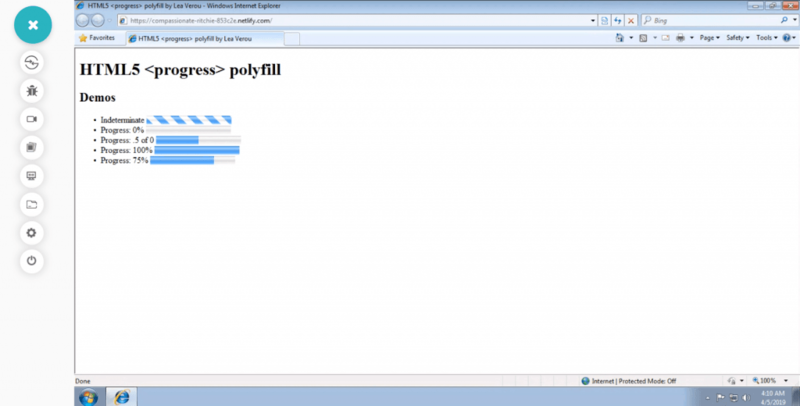 Above mentioned is a screenshot for demonstrating HTML5 progress polyfill for IE9. I have made use of LambdaTest which is a cloud-based, cross browser testing tool offering more than 2000+ real browsers and browser versions running across different mobile and desktop devices. By performing cross browser testing on LambdaTest you can ensure your website or web-app renders seamless across different browsers. With in-built, developer tools for every browser you can easily debug and test your code for cross browser compatibility. With that said, if you are curious to know more about additional resources visit Lea Verou’s website or the polyfill page. Published on Web Code Geeks with permission by Nikhil Tyagi, partner at our WCG program. 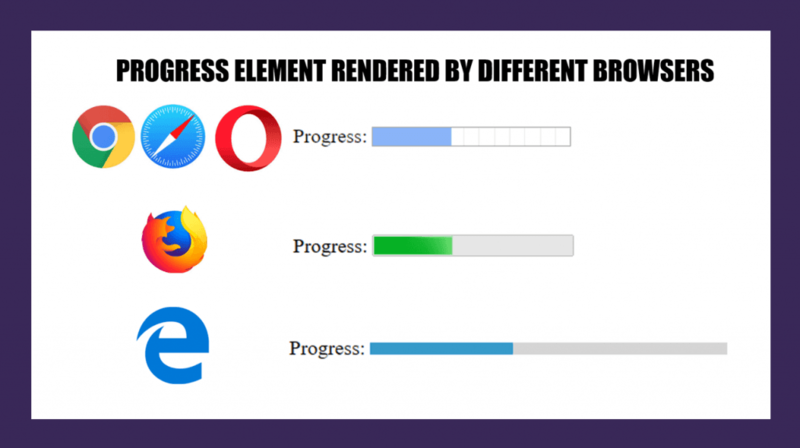 See the original article here: How To Create A Cross Browser Compatible HTML Progress Bar?